There are many challenges to operating a HVAC business, including pressure from the competition on price and service. Customers want face service because they want their heating or air conditioning fixed quickly so they can have their comfort back, so it means being responsive and reliable before the competition does it for you. 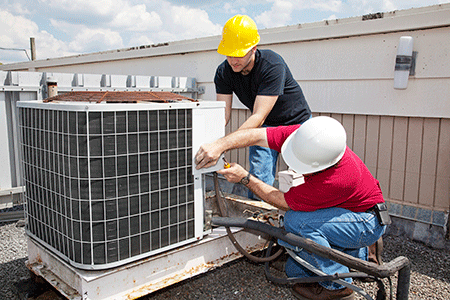 Then, there are costs associated with running a HVAC business. These expenses include specialized equipment, a fleet of vehicles, fuel for the fleet and software for business management in addition to typical business costs like worker's compensation, medical insurance, and liability insurance. These typical business costs can often grow larger if accidents occur on the job, including a fleet vehicle that breaks down or causes an accident from mechanical failure. In a business that relies on its vehicles to get to jobs and help clients with their heating and air conditioning needs, those vehicles actually have quite an effect on business results, including the amount of costs created or revenue generated. Inefficient vehicles can mean greater fuel, maintenance, and repair costs. A vehicle that breaks down can mean lost revenue and a damaged reputation. A fleet truck that causes an accident means a lost vehicle and greater liability on the company. Inaccurate or incomplete fleet records can mean increased tax burden because expenses related to mileage, fuel, and repairs was not reported. Your investment in vehicles is a significant expense that you want to get a return on investment from so these vehicles have to be maintained in a way that helps them retain their value for greater re-sale value in the future. Those driving the HVAC fleet are more concerned with getting to a job and getting the work done than necessarily keeping track of the mileage, gas expense, or any maintenance they had to get done. However, in running the business, you rely on these drivers to help you keep track of this information often using manual processes. When you are busy running your HVAC business, you may not be on top of which vehicle needs what service or whether or not there are any warranties set to expire or recall notices gone unnoticed. The old adage of "if it ain't broke don't fix it" does not apply to vehicle maintenance in the HVAC industry. The vehicles must be reliable to get to the service accounts and make the revenue necessary. Thatâ€™s why it is important to be proactive with maintenance rather than waiting for it to break and experience unnecessary downtime that costs the business and damages customer relationships. Not to mention the liability that could come if a vehicleâ€™s maintenance issues cause accidents. HVAC companies need a solution that can help them be proactive and manage their business from the perspective that their fleet vehicles determine profitability in the long run. Cloud-based technology that focuses on features and functionality that tracks fleet vehicles can change how a HVAC business manages its overall business, including revenue, costs, client relationships and business reputation. No matter what the size, this new technology solution for vehicle maintenance management is offering a solution for the challenges faced in a service-based industry. Cloud-based solutions provide a way for a HVAC business to have data on its vehicles available anytime, anywhere, including with the drivers and office personnel. Having the most current information to work with means making more informed decisions and pinpointing issues before they become problems so that they can be proactively addressed. In addition, a cloud-based technology solution offers greater data integrity and tracking along with scalability to grow with your business. The solution can also be easily integrated with existing software so that the data can be shared and analyzed in different ways. This will help identify maintenance issues and repairs that are necessary before downtime impacts the HVAC business. In the meantime, your data does not need additional backup solutions or new solutions should your fleet grow in size. Additionally, the tracking functionality provides a way to alert customers to the approximate arrival time of your driver. At the same time, this GPS functionality can help one of your drivers re-route if there is traffic to ensure timely arrival for appointments. These additional features help to enhance the service experience for the customer and help to maintain satisfaction and reputation for the business. Is the solution easy to use for all, including those in the field and office, or will it require significant training? What type of data analysis does it offer and does this match what I need for my HVAC business? Will it scale as I grow my business and add more vehicles to the fleet or will I need to find another solution when I reach a certain number of vehicles? Does the solution provide GPS tracking to gauge driver performance and location as well as provide additional metrics for data analysis that helps understand vehicle and driver performance? Will it integrate with other types of software so the data can be uploaded and downloaded to create different types of reports for further analysis? With these factors as your framework, you can start addressing the challenges you have faced and begin to realize better operating performance with a reliable fleet that makes you money instead of costs you money.